IF YOU'VE FLOWN MORE THAN A FEW TIMES the chances are that at least one trip was aboard a Boeing 737. And here's how Boeing makes this most successful machine. SMN report: We're suckers for time-lapse movies, and the one (below) is no exception. There's no real comparison to be made with even the most complex plastic kit of course, but even so, both the real thing and a 1:144 scale model share the same basic requirement - an assembly operation. 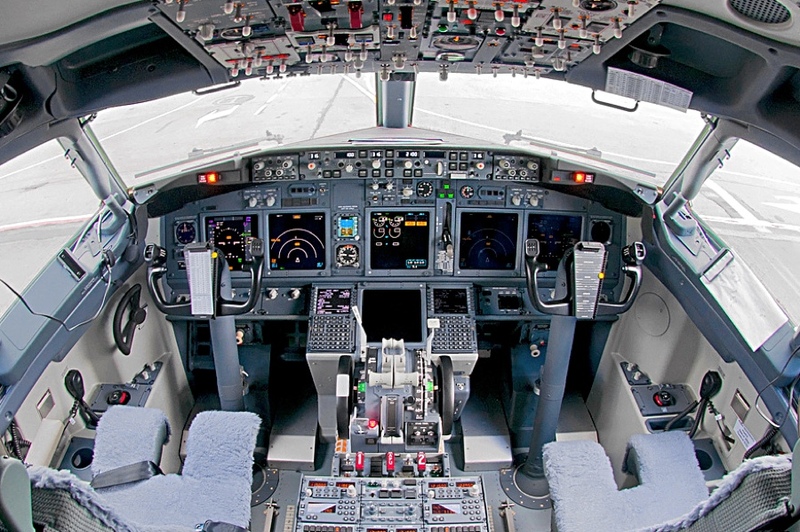 Incidentally, the flight deck (header pic) shows a 737 flown by Siberia Airlines. In the model world, there is no shortage of Boeing 737 kits, though injection plastic miniatures are mostly to standard 1:144 scale, with diecast considerably smaller, all the way down through 1:200 and 1:500 models from respected manufacturers such as Herpa Wings and Gemini Jets. Sad to say, there's nothing to 1:72 scale or larger. Neither is there much in the way of interior detail. You'd have thought that at least one enterprising manufacturer would have come up with a transparent-half kit, with decent flight deck and cabin detail. Or even, if that would be too big, a nose section might be cool, perhaps including all detail back to the front loading door. We can but hope. A classic oldie, the 1:144 scale US Airfix kit (below) was presented in a singularly ordinary box design. The basic tooling has been reboxed many times. Perhaps one of the most complex graphic designs to ever decorate an airframe, the Spirit of the Islands livery for Alaska Airlines (below) made a real change from the more usual fur-clad Alaskan native on the tail fin. 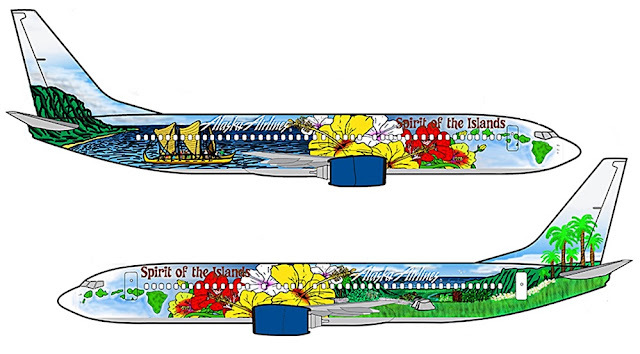 The Spirit scheme was designed for the airline's Hawaii routes. An example (below) of a simple display model, such as you might see in a travel agent. This 737 is not produced to any particular scale, but is attractive enough. Incidentally, Ryanair has had plenty of stick from the media for the pugnacious behaviour of its chief executive. 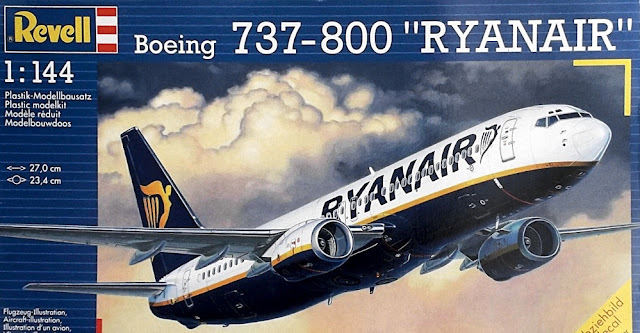 But our first trip on a Ryanair flight recently revealed polite and helpful staff, an offer of free hold storage, and on-time flights both ways - the trip back was actually nearly half an hour early. 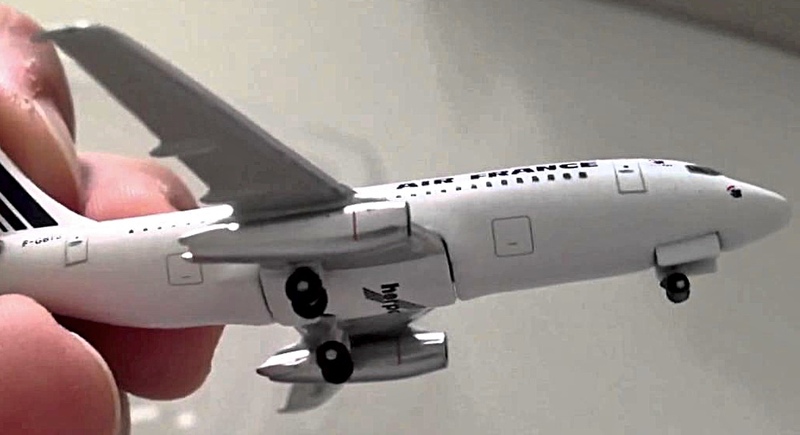 The Revell 737-800 (below) models one of the latest jets in the 737 range. It's a neatly detailed kit that surpasses the old Airfix model in every way, and is highly recommended. 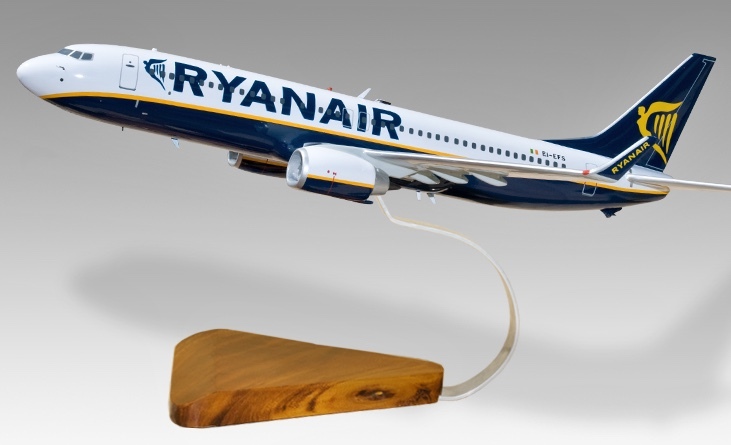 The 737 (below) is just one of the huge range of beautifully detailed diecast and snap-fit civil aircraft from Herpa Wings. Scales range from 1:180 (snap-fit) to 1:200, 1:400, and 1:500, depending on the subject. All are neatly detailed. With total production currently standing at more than 13,500 aircraft - and with some 4500 of those currently flying - the Boeing 737 is the single most successful commercial jet ever made. First flight of the 737-100 was in 1967, and Boeing has continuously developed the basic design to keep up with the competition, including the similar-layout Airbus A320 series. For modellers, the 737 represents a wide field of finishing opportunities. Currently, 500-odd airlines fly it, so the choice of livery is yours!